It is difficult to determine how many deaths are caused by Alzheimer’s disease each year because of the way causes of death are recorded. According to data from the National Center for Health Statistics of the Centers for Disease Control and Prevention (CDC), 84,767 people died from Alzheimer’s disease in 2013. The CDC considers a person to have died from Alzheimer’s if the death certificate lists Alzheimer’s as the underlying cause of death, defined by the World Health Organization as “the disease or injury which initiated the train of events leading directly to death.” However, death certificates for individuals with Alzheimer’s often list acute conditions such as pneumonia as the primary cause of death rather than Alzheimer’s. Severe dementia frequently causes complications such as immobility, swallowing disorders and malnutrition that can significantly increase the risk of other serious conditions that can cause death. One such condition is pneumonia, which is the most commonly identified cause of death among elderly people with Alzheimer’s disease and other dementias. The number of people with Alzheimer’s disease who die while experiencing these other conditions may not be counted among the number of people who died from Alzheimer’s disease according to the CDC definition, even though Alzheimer’s disease is likely a contributing cause of death. Thus, it is likely that Alzheimer’s disease is a contributing cause of death for more Americans than is indicated by CDC data. A recent study using data from the Rush Memory and Aging Project and the Religious Orders Study supports this concept; researchers estimated that 500,000 deaths among people age 75 and older could be attributed to Alzheimer’s disease in the United States in 2010 (estimates for people age 65 to 74 were not available), meaning that those deaths would not be expected to occur in that year if those individuals did not have Alzheimer’s. The situation has been described as a “blurred distinction between death with dementia and death from dementia.” According to data from the Chicago Health and Aging Project (CHAP), an estimated 600,000 people age 65 and older died with Alzheimer’s in the United States in 2010, meaning they died after developing Alzheimer’s disease. Of these, an estimated 400,000 were age 85 and older, and an estimated 200,000 were age 65 to 84. Furthermore, according to Medicare data, one-third of all seniors who die in a given year have been diagnosed with Alzheimer’s or another dementia. Although some seniors who die with Alzheimer’s disease die from causes that are unrelated to Alzheimer’s, many of them die from Alzheimer’s disease itself or from conditions in which Alzheimer’s was a contributing cause, such as pneumonia. A recent study evaluating the contribution of individual common diseases to death using a nationally representative sample of older adults found that dementia was the second largest contributor to death behind heart failure. Thus, for people who die with Alzheimer’s, the disease is expected to be a significant direct contributor to their deaths. In 2015, an estimated 700,000 people in the United States age 65 and older will die with Alzheimer’s based on CHAP data. The true number of deaths caused by Alzheimer’s is likely to be somewhere between the official estimated numbers of those dying from Alzheimer’s (as indicated by death certificates) and those dying with Alzheimer’s. Regardless of the cause of death, among people age 70, 61 percent of those with Alzheimer’s are expected to die before age 80 compared with 30 percent of people without Alzheimer’s. As the population of the United States ages, Alzheimer’s is becoming a more common cause of death. Although deaths from other major causes have decreased significantly, official records indicate that deaths from Alzheimer’s disease have increased significantly. 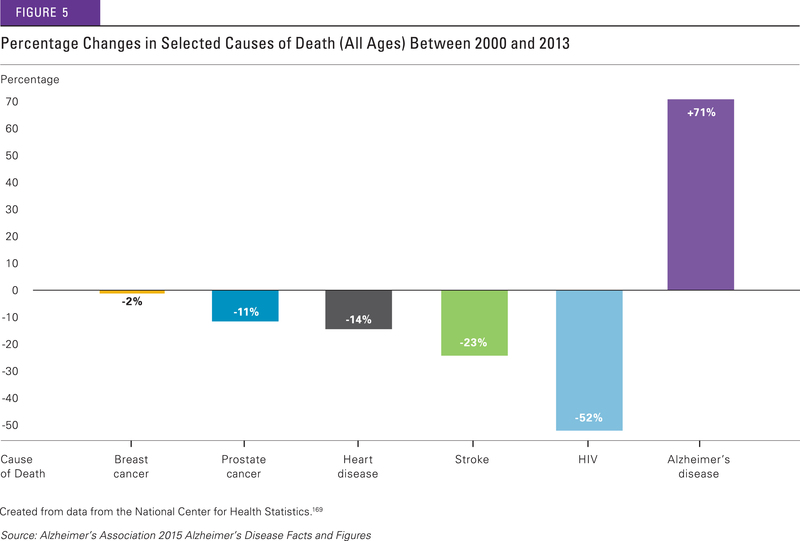 Between 2000 and 2013, deaths attributed to Alzheimer’s disease increased 71 percent, while those attributed to the number one cause of death (heart disease) decreased 14 percent (Figure 5). The increase in the number and proportion of death certificates listing Alzheimer’s as the underlying cause of death reflects both changes in patterns of reporting deaths on death certificates over time as well as an increase in the actual number of deaths attributable to Alzheimer’s. This blog post was assembled from the 2015 Alzheimer’s Disease Facts and Figures – Mortality and Morbidity – all footnotes have been omitted, but the report in it’s entirety is available here.